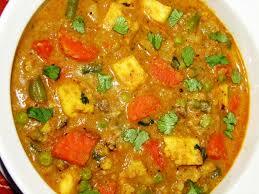 Gandhi Indian Cuisine stands to delight the senses of people with the rich aromas and lavishing food preparations. 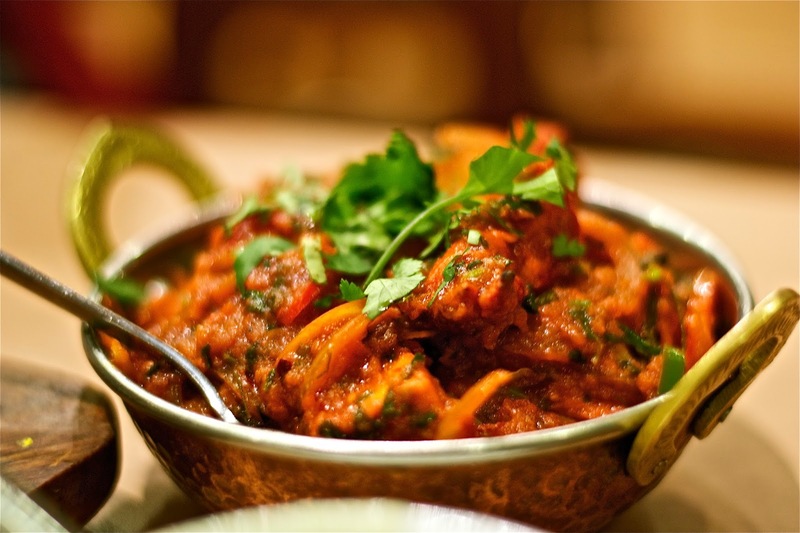 Gandhi Indian Cuisine is a well established place with painstakingly perfected interior from the riches of the mother country. With the idea of having the Indian setup and visual merchandise, the restaurant will offer the guests with the typical food taste along with the Indian environment and surroundings making them feel to be in India. 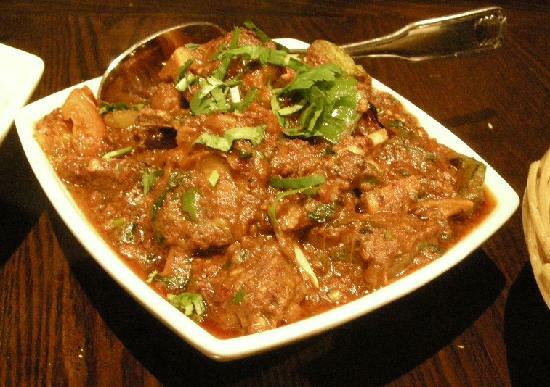 Lamb meat marinated and cooked with herbs and spices. Served with white basmati rice. 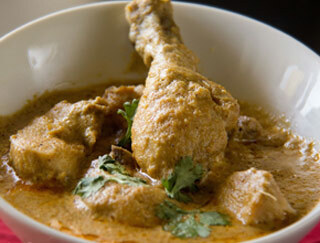 Piece of chicken cooked in creamy coconut sauce. Served with white basmati rice. 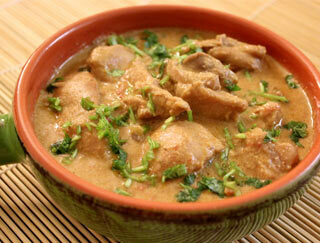 Pieces of goat cooked with onion gravy and spices. Served with white basmati rice. 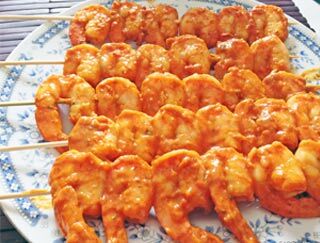 Lightly spiced, pan fried shrimp cooked in tomato and butter gravy. Served with white basmati rice. 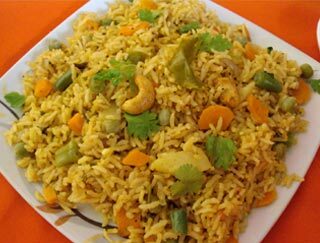 Medley of vegetables and rice with fragrant herbs and spices. Bone-in chicken marinated in mildly spiced ginger yogurt sauce. 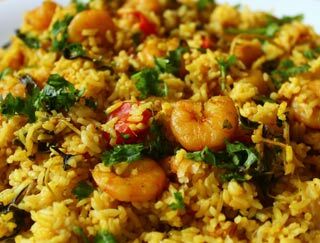 Served roasted or grilled with white basmati rice. 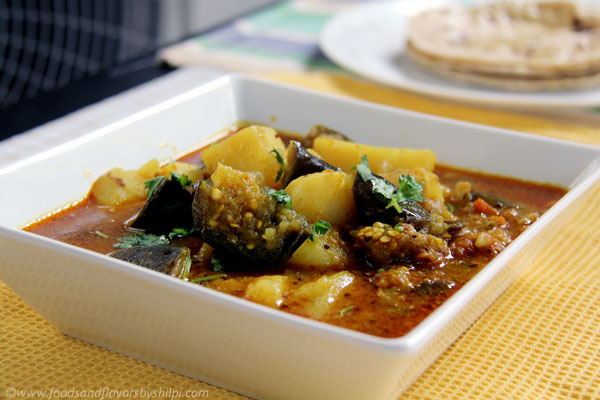 Diced potatoes cooked with fragrant herbs, spices and eggplant. Served with white basmati rice. Shrimp cooked in delicious creamy sauce. Served with white basmati rice. 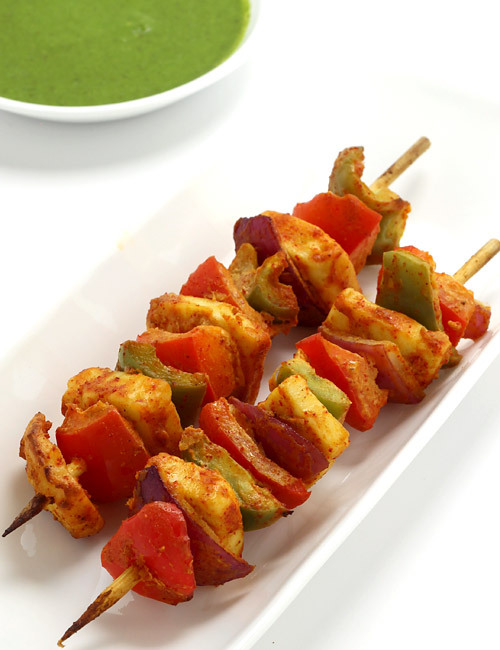 Cooked with sauteed onion and bell pepper with mild blend of house spices. Served with white basmati rice. 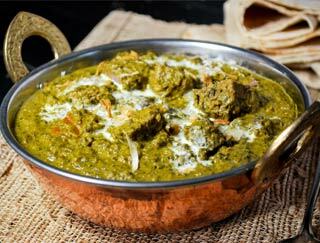 Lamb meat with cooked spinach in a mild spices. Served with white basmati rice. 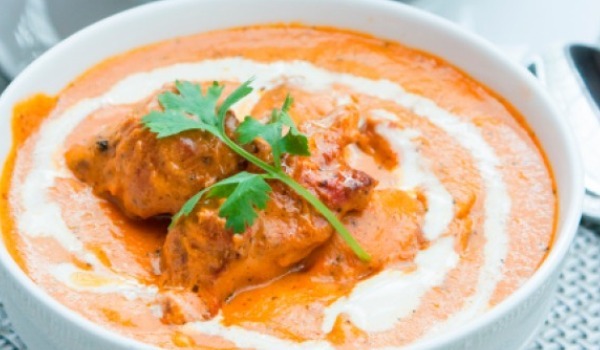 Boneless chicken breast meat marinated in herbs and ginger yogurt sauce. 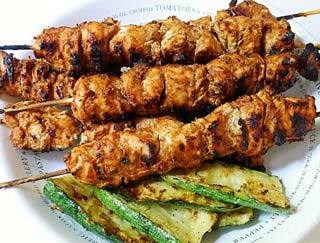 Served roasted or grilled with white basmati rice. 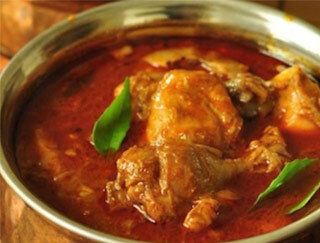 Chicken cooked in onion gravy with mild spices. Served with white basmati rice. 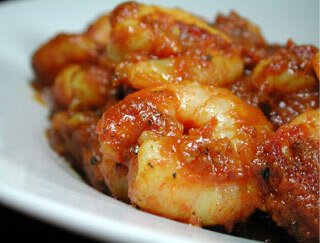 Lightly spiced shrimp tossed in hot spices with potatoes. Served with white basmati rice. Lamb meat cooked in subtle flavor and stir fried with rice. 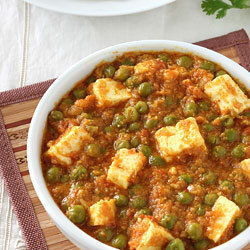 Cottage cheese sauteed with onion, bell pepper, ginger paste and finished with onion gravy. Served with white basmati rice. 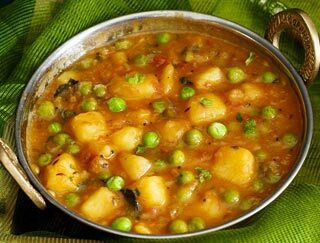 Potatoes and peas cooked in onion and tomato sauce. Served with white basmati rice. Steamed shrimp cooked in subtle flavor and stir fried with rice. 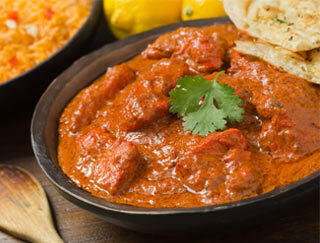 Boneless lamb marinated in mild spices. Served roasted or grilled with white basmati rice. 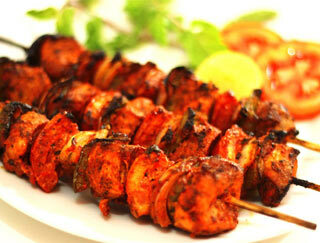 Soft juicy chunks of cottage cheese marinated in tandoori masala. Served roasted or grilled with white basmati rice. 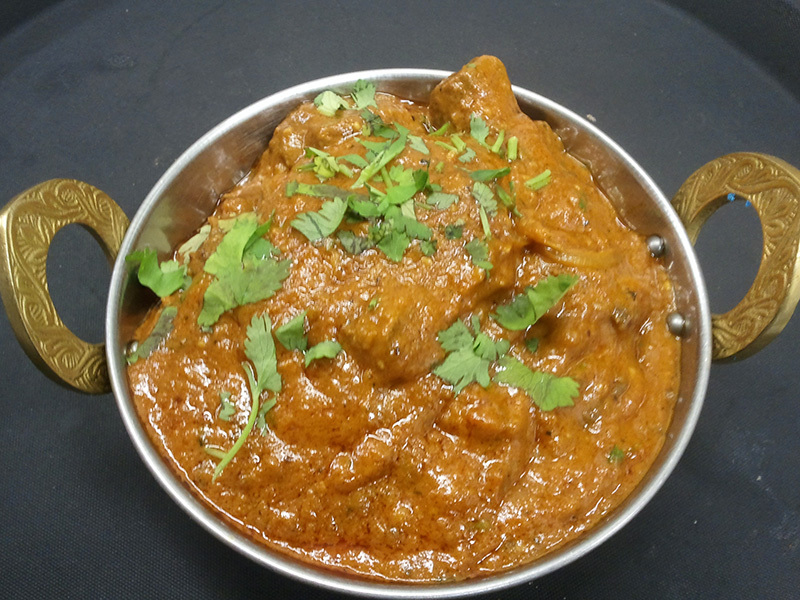 Tandoori lamb cooked in tomato and butter gravy. Served with white basmati rice. Ginger lemon marinated fish cooked in a curry sauce. Served with white basmati rice. Chicken pieces roasted in the clay oven and tossed in a mild creamed butter sauce. Served with white basmati rice. 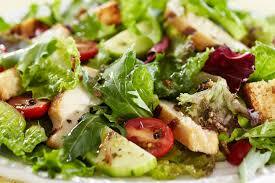 White meat chicken with seasonal greens. 6 deep fried minced vegetable rolls, cooked in savory butter and herb. Served with white basmati rice. 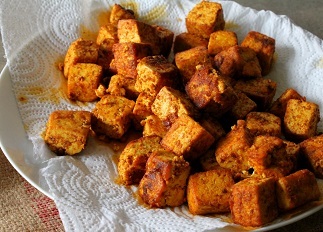 Pieces of firm tofu marinated in mild spices and baked in clay oven. 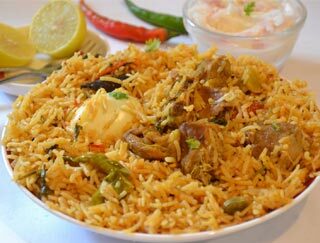 Served roasted or grilled with white basmati rice. 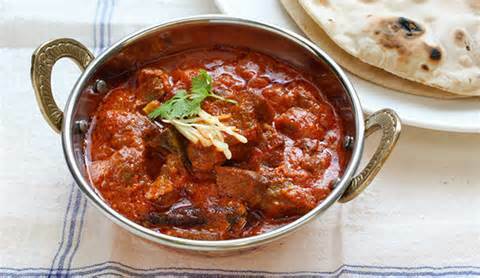 Pieces of lamb meat cooked in tomato and onion curry sauce. Served with white basmati rice. 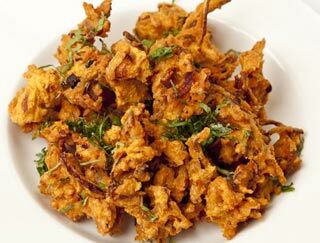 Sliced onions dipped in lightly spiced, seasoned gram flour. Served with mint and tamarind sauce. 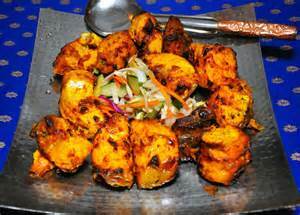 Traditional Indian chicken prepared with special spices and nuts. Served with white basmati rice. 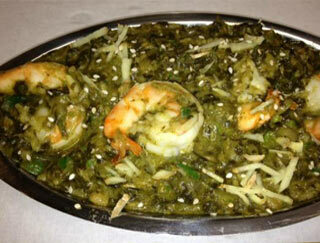 Shrimp cooked with spinach and blend of mild spices. Served with white basmati rice. Pieces of mahi mahi marinated in an aromatic herbal mixture. Served roasted or grilled with white basmati rice. 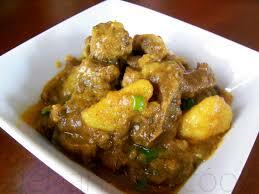 Goat meat cooked in subtle flavor and stir fried with rice. 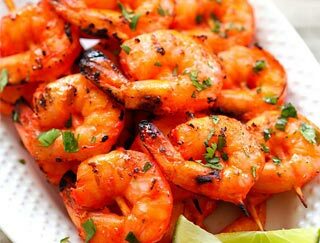 Shrimp marinated in mild spice. 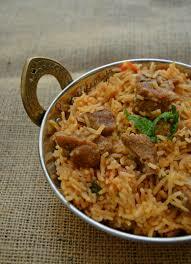 Served roasted or grilled with white basmati rice. 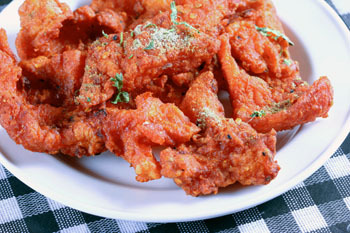 White meat chicken pieces marinated, battered in seasoned chickpea flour and fried. Served with mint and tamarind sauce. 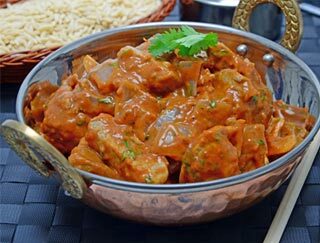 Pieces of chicken cooked in spices with potatoes. Served with white basmati rice. 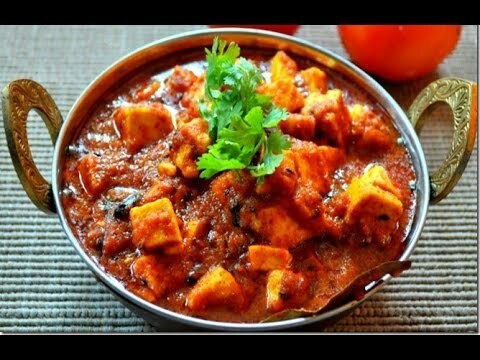 Boneless tandoori chicken cooked in tomato and butter gravy. Served with white basmati rice. 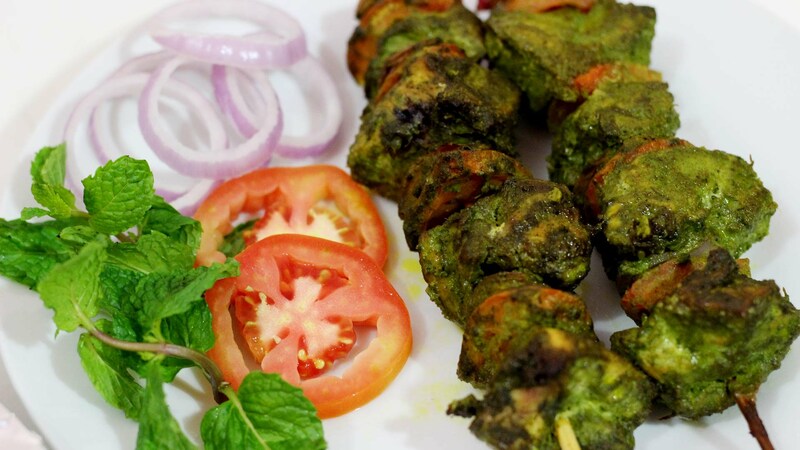 Tandoori grilled chicken breast with mint, marinated in herb sauce. 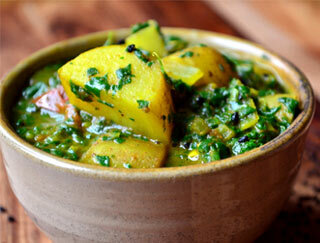 Served roasted or grilled with white basmati rice. Pieces of fish marinated, herb battered and fried to perfection. Served with mint and tamarind sauce. 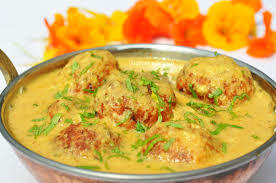 Multiple vegetables with farmed cheese and nuts, cooked in mildly creamy sauce. Served with white basmati rice. 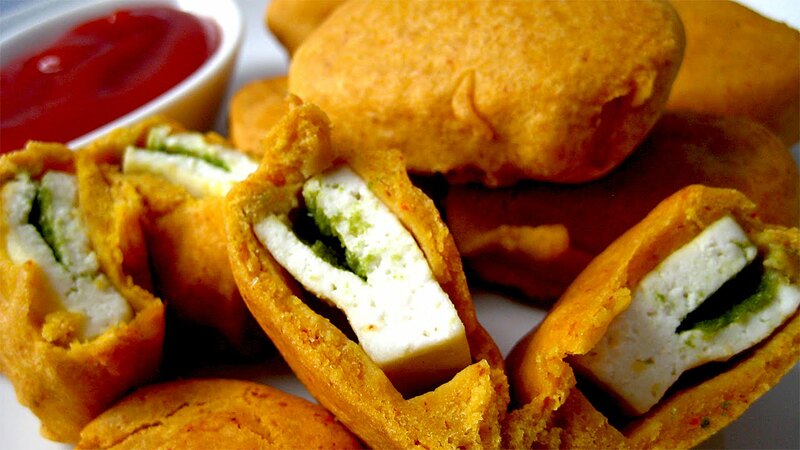 Cottage cheese stuffed with mint sauce, battered and deep fried. Served with mint and tamarind sauce. Fresh ginger favored ground lamb rolls cooked on skewers. 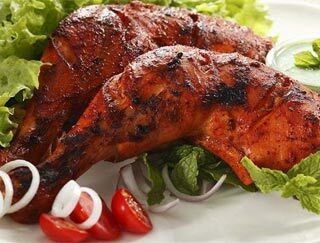 Served roasted or grilled with white basmati rice. 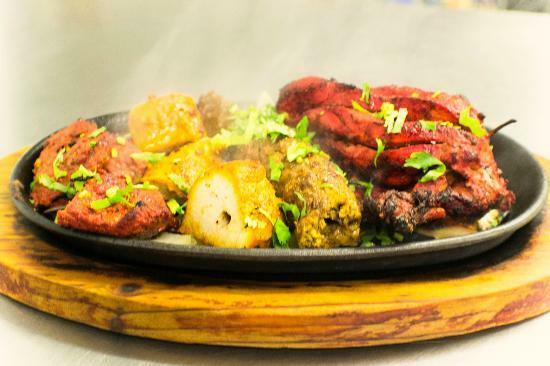 A combination of chicken tikka, tandoori chicken, tandoori shrimp, lamb tikka and seekh kabob. Served roasted or grilled with white basmati rice. 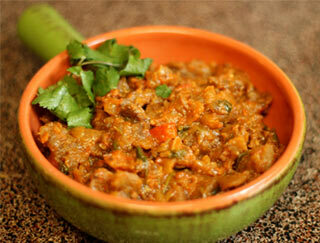 Whole eggplant baked in clay oven, blended with sauteed onions, tomatoes and garlic cloves. Served with white basmati rice. 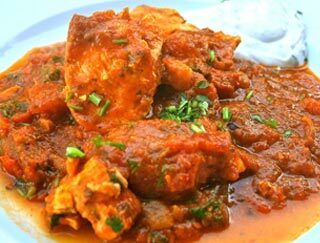 Pieces of chicken sauteed with onion, bell pepper, ginger, garlic and tomatoes cooked in onion gravy with spices. Served with white basmati rice. 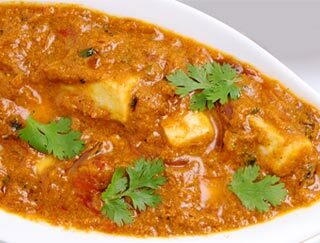 Pieces of cottage cheese in creamy tomato gravy with mild spices. Served with white basmati rice. Potatoes tossed in mildly seasoned spinach. Served with white basmati rice. 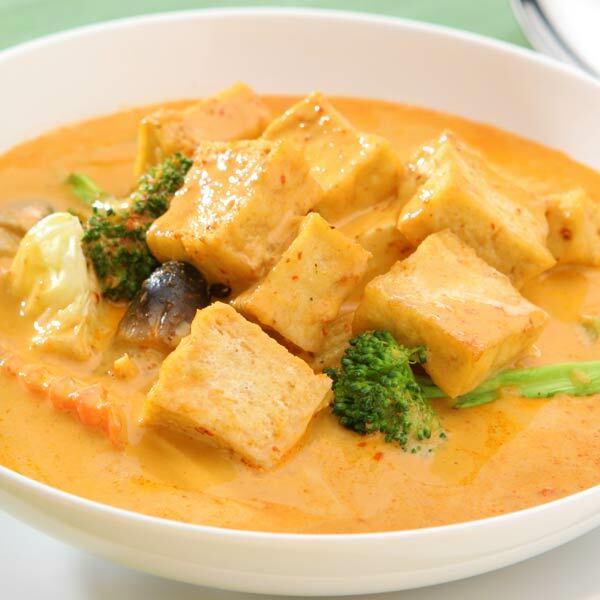 Tofu cooked in coconut sauce with blend of home spices. Served with white basmati rice.